Slowworms (also called blindworms) are a small genus (Anguis) of snakelike legless lizards in the family Anguidae. 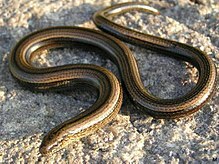 The genus has two living species, the common slowworm and the Peloponnese slowworm and up to three fossil species. Slowworms are typically grey-brown, with the females having a coppery sheen and two lateral black , and the males displaying electric blue spots, particularly in the breeding season. They give birth to live young; the young are about 4 cm (1.6 in) long at birth and generally have golden stripes. Slowworms are slow-moving and can be easily caught, which has given rise to the folk etymology that the slow- in slowworm is the same as the English adjective slow; the actual origin is a Proto-Germanic root which simply means "slowworm". Like many lizards, slowworms can shed their tails to distract predators. The tail regrows, but never fully. Principal predators are birds, badgers, hedgehogs, foxes and domestic cats. The average British slowworm will grow to 45 cm when fully mature and weigh approximately 100 g, females being slightly larger than the males. The tail makes up around half of its length, but is indistinguishable from the body. They have been recorded to live for up to 30 years in wild, and the record age for a slowworm in captivity is 54 years (Copenhagen Zoo). The part of their scientific name 'fragilis' (fragile) comes from the tendency of this species to shed its own tail, when threatened by predators, or if handled too roughly (caudal autotomy). Although slowworms much resemble snakes, and are often mistaken for such, they are actually lizards which have lost their limbs completely with evolution. Slowworms can be distinguished from snakes by several features: their eyelids, which snakes lack entirely; their small ear openings, which again snakes lack; and their tongues, which are notched in the centre rather than completely forked like a snake's. Slowworms live in any habitat that is warm and protected such as woodland, grassland and heathland; they are frequently found in garden compost heaps. They range across most of Europe, and into parts of Asia, but they are restricted to temperate and humid habitats. They hibernate from October to February/March, both communally and solitarily, and sometimes share hibernating sites with other reptiles. Slowworms have grooved teeth which allow them to grab and swallow whole their soft invertebrate prey, such as slugs, hairless caterpillars and other insects, spiders and earthworms. Snails are usually avoided, except when they are still very young and the shell can be broken easily. Slowworms are protected in the United Kingdom and Poland. ^ a b c d Jozef Klembara; Michael Rummel (2018). "New material of Ophisaurus, Anguis and Pseudopus (Squamata, Anguidae, Anguinae) from the Miocene of the Czech Republic and Germany and systematic revision and palaeobiogeography of the Cenozoic Anguinae". Geological Magazine. 155 (1): 20–44. doi:10.1017/S0016756816000753. ^ "RSPB - Wildlife Garden A to Z". Retrieved 30 May 2014. ^ "Wild about gardens - Slow worm". Retrieved 30 May 2014. ^ "Wildlife Watch - Beast of the month". Archived from the original on 30 May 2014. Retrieved 30 May 2014. ^ a b "The Wildlife Trusts - Slow worm". Retrieved 30 May 2014. ^ "RSPB - Ask an expert". Retrieved 30 May 2014. Wikimedia Commons has media related to Anguis. "Slow-Worm" . Encyclopedia Americana. 1920. This page was last edited on 17 November 2018, at 10:05 (UTC).